I didn't personally get Generic Drontal from this website but I got it from a friend and Generic Drontal is the best!! My dog had terrible tape worms and the medication that was originally given to her didn't work and she was taking it for over a month. Finally, we got Drontal and it killed all the worms in one day! Thank goodness because the worms were really gross. I highly recommend Drontal for tape worms. I was always worried about my dogs and this medication right here gives me peace of mind. Thank you so much!!!!!!!!!!!!! 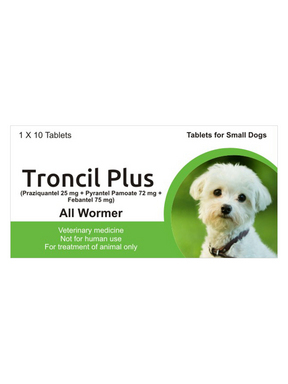 I've been deworming my dogs with generic drontal for years already and I know they;ve been worm free ever since. They are healthy Pet Shed Pets. I love Pet Shed's other generic products too such as Heartveil. I have a pack and I get to deworm all of them with Pet Shed's wormers. generic drontal is really a big help. Very effective to use. Easy to hide. Dogs have never been this easy to deworm! Thank you Pet Shed! I've learned about Pet Shed through the shelter. They use generic drontal for the dogs there. It's a great wormer and a cheap one, too! Try it and you won't regret buying this cheaper wormer. I wouldn't switch again. I'm very pleased with how these wormers work. I've never seen a single worm on my dogs ever since. I love buying this from PEt Shed. Affordable wormers and fast delivery to my place! Lets me save a lot more!